Flag Day is a public holiday in Tajikistan, that is annually celebrated on November 24. This holiday was established by President of Tajikistan in 2009 to commemorate the anniversary of adoption of the national flag in 1992. The flag of Tajikistan consists of three stripes of red, green and white colors. A golden crown with seven five-pointed stars is situated in the middle of the white strap. The flag of Tajikistan was originally formed by adding white and green stripes to the red flag of the former Tajik SSR. The choice of the colors emphasizes Persian culture and religion of Tajikistan. 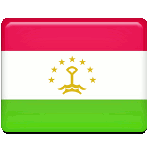 By the way, the flag of Tajikistan reminds the flag of Iran, however, the red and green stripes and reversed. Every color, as well as the crown and the stars on the flag, have their own significant meaning. Red is the symbol of unity of the nation, it also represents sun and victory. Green is a common symbol of Islam. And white stands for cotton, purity, snowy mountain peaks and unity of the people. The golden crown represents the Tajik nation, with seven stars over its head. Number 7 is a symbol of perfection and it's also embodiment of happiness. The depiction of the stars is taken from the Tajik legend, stating that the Islamic heaven consists of seven orchids, separated by seven mountains each having a glowing star on its summit.